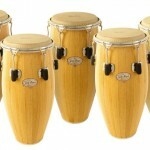 The Primero Congas are made of Thai Oak and are in a Natural wood finish. 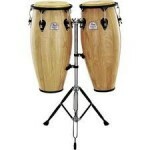 They come in 2 sizes: 10" and 11". 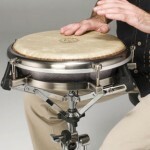 Stands are optional and available in basket style or adjustable height. 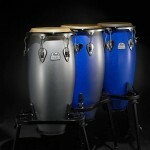 The Primero line also produces a model in Fiberglass which is very durable and a great product for pre-college schools. They come in a black finish. 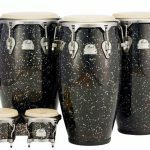 The Pearl Bobby Allende Fiberglass Congas have the projection of Fiberglass and yet the warmth of wood. 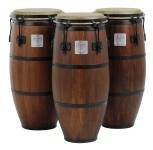 The drums are 28" high which is the traditional "salsa" drum size. 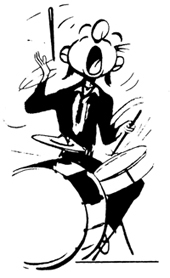 Hoops are contoured and the base has rubber protection built in. They are all seamless fiberglass and will vibrate freely. 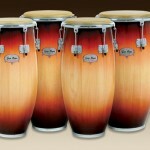 Bobby Allende assisted Pearl in designing these congas and did a fantastic job. Available in Confetti color. 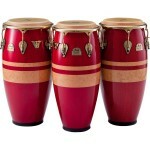 The Pearl Richie Flores Signature Congas are made of aged Thai Oak and feature contour rims and are 30" in height. The heads are skin and hand picked for top quality. 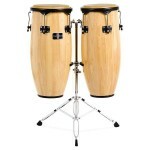 They have a warm, wood sound but project well. 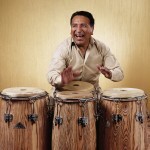 Richie's design is for the professional player who is looking for a versatile conga that will work well in an ensemble. Available in 3 sizes with a stunning Lunar Eclipse finish.